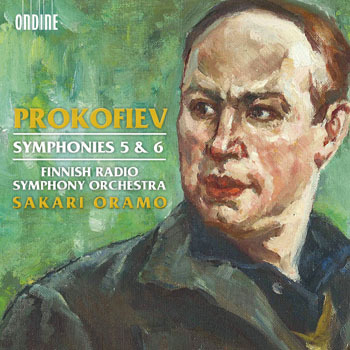 This release features the Finnish RSO under the baton of Sakari Oramo with symphonies 5 & 6 by Sergei Prokofiev. Prokofiev's symphonies 5 & 6, composed in 1944 and 1947, are very different in their mood, but stylistically closely related. The Fifth was written amidst the chaos of the Second World War and seeks to find positive solution to that chaos; but in the Sixth, completed soon after war, the mood is darker. Both feature Prokofiev's melodic writing at its best. Sakari Oramo served as chief conductor of the Finnish RSO from 2003 to 2012. In February 2012 he made his debut with the Vienna Philharmonic Orchestra. As of autumn 2013 he will be the chief conductor of the BBC Symphony Orchestra. Oramo has especially gained recognition for recordings of 20th-century and contemporary (Finnish) composers. Contemporary and above all the latest contemporary music is a major item in the repertoire of the Finnish RSO. Their recordings, already over 100, have received many prestigious awards. The new chief conductor as of autumn 2013 is Hannu Lintu. The two symphonies here fit on one CD and make a substantial total playing time of 79:59.